The marionettes theater includes a foundation base a front portal with a curtain a back horizon without printing. The back horizons can be customized by themselves, or a self-adhesive wallpaper with different motifs can be purchased. All parts of the theater enter a base of dimensions 9 x 123 x 90 cm and the theater is so very comfortable. Size of marionettes is 14"-20" (35 -50 cm. ). 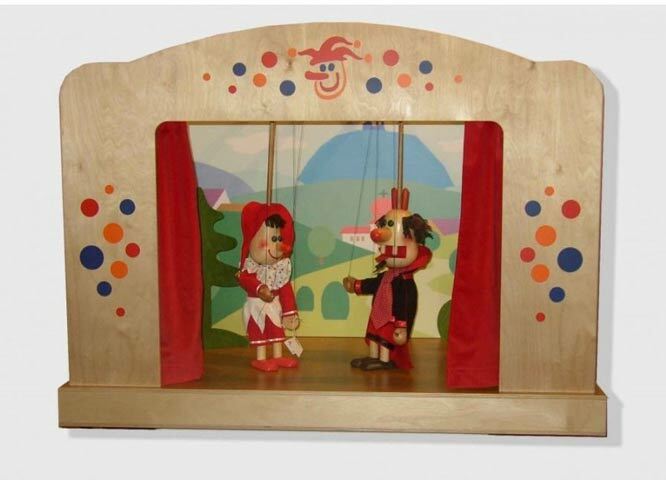 An Large wooden puppets theater, handmade by a Czech artist. The theatre is used for playing in a home theater or as puppet show for preschoolers, educational toy for a child.